Red Velour suit with faux shearling and bells. Velcro for easy fit. Includes an adorable Santa Hat and beard. Faux leather belt adjusts for a secure fit. 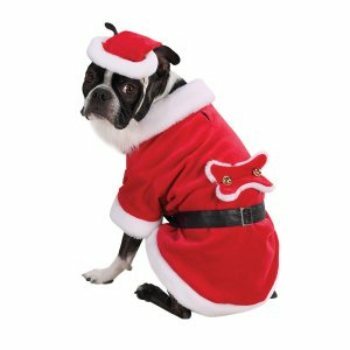 Gorgeous Santa Claus Christmas costume for dogs! X-Small Up to 8" 10" - 16" 17" - 22"
Small 8" - 12" 12" - 18" 22" - 26"
Medium 12" - 16" 14" - 21" 26" - 30"
Large 16" - 20" 16" - 23" 30" - 34"
X-Large 20" - 24" 18" - 24" 34" - 38"